IMHO this collaborative effort to share their canoe routes and stories is inspiring. "Canoe Nova Scotia: Paddlers’ Stories of Freshwater Routes was created in 2011 by a volunteer"
"group of paddlers with a passion for canoeing in Nova Scotia. More comfortable with a paddle in our hands than a pen, we felt collaboration with many canoeists would be helpful in sharing stories." "Over the span of 12 months, we found enthusiasts who were equally keen on sharing their stories re-"
"sulting in the informal Nova Scotia Canoeing Collective. To propel the work into reality, we partnered with Canoe Kayak Nova Scotia, the official voice of paddling for the province, and sought local funding partners." "Through hundreds of hours of volunteer time, 10 authors contributed their stories on 17 routes from"
"across Nova Scotia. We raised funds for printing costs, learned design software, added maps to help with directions, and included photos to inspire your imagination." 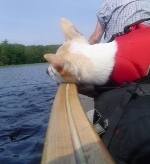 "There are hundreds of canoe routes in Nova Scotia. We agreed we weren’t looking to write about the"
"best or famous ones, but rather trips with stories that would inspire others to participate in paddling." What a great contribution to the paddling community. I'll prepare Route descriptions for posting in the Nova Scotia Route Forums.